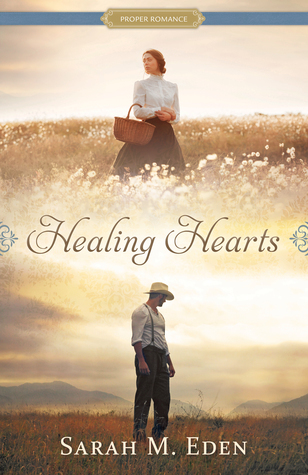 As the only doctor in the frontier town of Savage Wells, Gideon MacNamara knows his prospects for a bride are limited. The womenfolk in town are either too young, too old, or already spoken for. So, being a practical man, he decides to take advantage of the matchmaking service of the day—mail-order brides—and sends away for a woman with nursing experience. When Miriam steps off the stagecoach in Savage Wells, she sees a bright future in front of her. But when the town—and Gideon—meets her, ready for a wedding, her excitement quickly turns to horror. Somehow Dr. MacNamara's message had gotten turned around. He didn’t want a nurse, he wanted a wife. When she refuses to marry him, she finds herself stranded in Savage Wells with some very unhappy townspeople. Every time I pick up a book by Sarah Eden I am reminded just why I love her books so much. They always feel so good to me- like wrapping up in the coziest blanket. Gentle, warm, inviting. The characters feel real and the story envelopes me. Poor Gideon. All he wants is someone to love and support him. He is lonely and tired. Little does he realize at first, but Miriam feels and longs for the exact same thing but where Gideon probably harbors some slight hope that one day that can still happen for him, I think Miriam has given up all hope. I can't even imagine the life she has lived, the terrible scenes she has witnessed or the poor treatment she has endured. My heart broke for her. I can't tell you how much I wanted all good things for both Gideon and Miriam. I was firmly invested in their stories and their happiness. This story was definitely of a more serious nature. There weren't many moments of lightness and joy but the story felt full, well developed and definitely held my interest and emotions. It was so good to return to Savage Wells and see some old friends from the first book. I really hope there will be more stories to come!